Fawns are definitely out and about and some have hit the ground running. They are the cutest! I woke up to another misty morning and much to my delight, had some visitors. This family decided to graze right by the house in the early morning. Aren’t those faces the sweetest? They are welcome any time and I wish they’d stop by in the daylight more often. I see their tracks every day so I know they are passing through during the night. Happy Monday, everyone. I believe this thing called Sun will come out at some point this week. We are overcast, soaking wet and the river is rising. I think that’s why these guys are close to the house. That and the pesky coyotes. 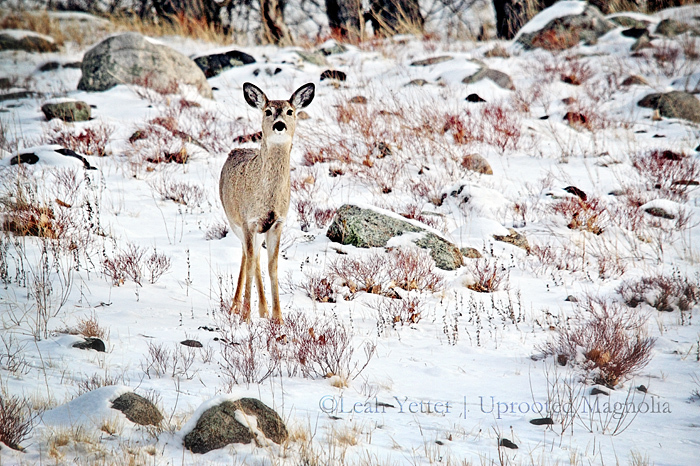 I love how the deer gracefully tiptoe into my path some days. Say what you will about my choice to leave city life for the country. Even though I miss bits of living in a big city, I’ll take this traffic jam over road rage and exhaust fumes any day. I love my early morning commute. Once again, we have found ourselves in a snowstorm. It’s pretty magical out there. These little birds are so cute jumping from blade to blade looking for breakfast. Besides hearing the snow under my boots, all I hear is the softest “chirp chirp” from these adorable gals. This storm is supposed to move out this afternoon and then warm up the rest of the week. I took a long walk along the river yesterday to get away from the computers and long editing list. I needed to unplug for a while and take a break in the sunshine. Especially when the weather is as gorgeous as it was yesterday. The wind wasn’t blowing and the air was warm and golden. 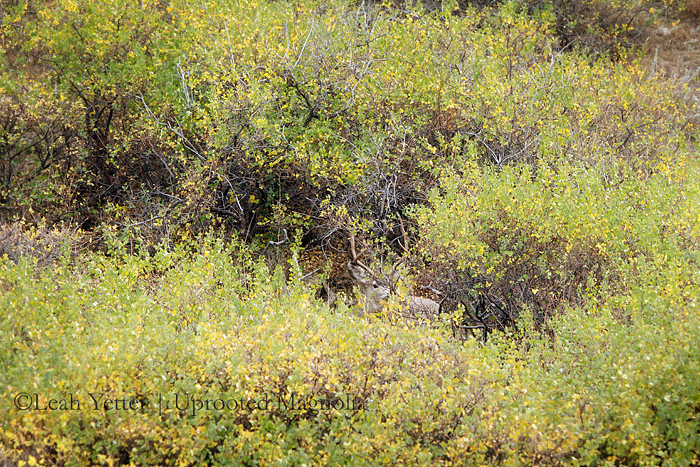 I decided I’d turn around and try to walk through the tall weeds among the cottonwoods and I startled this beauty from her rest. These may be weeds to me but to her it’s a hiding place and safe bed. I quietly backed up not wanting to bump her out of her safe place and started back the way I came. She hopped deeper into the weeds and I watched as her white pompom tail disappeared across the river. I wish you all a safe and happy weekend my friends! We spotted our first fawn this weekend. I wasn’t sure if I’d ever get to see them here at our new place but sure enough, this doe and her baby passed through the meadows yesterday afternoon. I am giddy with excitement but I did keep my distance. I want her to feel safe to come back. She stopped for a little sip of mother’s milk. So sweet! I promise to never complain of your warmth. I will not whine about your blinding bright sun that makes me squint when I step out every morning. I, along with many others, look forward to your arrival. I cannot wait to shed these four layers of clothes and let your light shine onto my goose-bumped skin. I look forward to your crisp evening air and colorful sunsets. I can almost smell the grill and cold martini’s on the deck. I’m just not sure how much longer I can take these winter storms in Spring. So c’mon, I know you can do it. Break on through this wintery madness and warm us. Please excuse the belly-aching. But I’ve never been one for patience. While uploading a sweet baby portrait shoot from yesterday, I came across this image of a deer bed I saw a few days ago during a nice walk around the meadows. Deer lay down in tall grass with the hope of staying hidden from predators. I like the flow and texture of the grass in this. And then, Sunday morning, the sun was there outside my door. Although 6 inches of snow still lay there glistening on the ground, the sky was blue and birds were singing. Patrick was home by 8am and we were able to spend the day feeding, watering and tripping over frozen cow turds together. We even ventured across the river and hiked around our bluffs to enjoy the peaceful scenery that surrounds us. I didn’t shoot much this weekend because the ranch work had to be done and I had to stay focused. As I’ve said before, I only pretend to be a cowgirl, I’m really just a photographer. But this weekend, I was a cowgirl first. I’m happy to report that we are still here with all our fingers and toes and happy to see the snow dripping off the roof today. Ahhhh, is it spring yet? “With cheeks like roses”, we here at Uprooted Magnolia from our chilly ranchette wish you and yours a splendid and very Merry Christmas. Happy Holidays to you, my sweet friends from around the globe. Be well. P.S. Matilda is taking a break from Tilda Tuesday but don’t worry, she’s curled up by the fire waiting for her next meal. He blends so well doesn’t he? I didn’t see him at first, I only felt him him staring me down with his big dark eyes. I stopped abruptly and turned to my left. There he stood in all his glory. Have a great weekend friends! It is a cold and frosty morning out here. But it’s supposed to warm up and this gorgeous frost will soon be gone. I still have more images to share from this snowy wander so keep in touch!